A Jordan Rhodes brace was enough to see Huddersfield into the Johnstone's Paint Trophy Northern Area final against Carlisle at the expense of Tranmere. Rhodes latched on to Alan Lee's flick-on to send a fine lob over home keeper Gunnar Nielsen. Rovers spurned a gilt-edged opportunity to level from the spot after Gary Roberts felled Ash Taylor, but Lateef Elford-Alliyu saw his effort saved. Rhodes then sealed it by sweeping home Lee's cross after a swift counter. "I thought a little bit of class was the difference between the two sides. "Some of the lads will be disappointed as a lot of them won't get within two games from playing at Wembley. "To lose three games on the bounce is something we're not used to and we've not done it before and it's something we need to stop now." "We had to compete and deal with their set-pieces - they've got a lot of variation and height in their side so they're always a threat from that. "I thought the back four in a defensive situation were outstanding as well as obviously the goalkeeper who's saved another penalty. "When we did show our quality with the ball we scored two terrific goals and maybe could have had one or two more." 90:00+1:02 Shot from just outside the box by Scott Arfield goes over the bar. 89:27 Free kick awarded for a foul by Scott Arfield on John Welsh. Aaron Cresswell produces a shot on goal direct from the free kick, Alex Smithies makes a save. 88:17 Free kick awarded for an unfair challenge on Jermaine Grandison by Joe Garner. Direct free kick taken by Gunnar Nielsen. 85:51 The official flags Ian Goodison offside. Alex Smithies restarts play with the free kick. 84:15 The referee penalises Lucas Akins for handball. Antony Kay restarts play with the free kick. 82:33 The ball is swung over by Antony Kay, John Welsh manages to make a clearance. 81:15 Substitution Jordan Rhodes goes off and Joe Garner comes on. 80:33 Free kick awarded for a foul by Jordan Rhodes on Jermaine Grandison. Gunnar Nielsen takes the free kick. 78:51 Adam McGurk concedes a free kick for a foul on Jamie McCombe. Alex Smithies takes the free kick. 77:11 Enoch Showunmi challenges Antony Kay unfairly and gives away a free kick. Antony Kay restarts play with the free kick. 77:11 Substitution Dale Jennings goes off and Adam McGurk comes on. 76:01 Free kick awarded for a foul by Enoch Showunmi on Antony Kay. Alex Smithies takes the free kick. 75:04 Jordan Rhodes is caught offside. Free kick taken by Gunnar Nielsen. 75:04 Substitution Alan Lee leaves the field to be replaced by Lee Novak. 72:57 Ian Goodison gives away a free kick for an unfair challenge on Anthony Pilkington. Direct free kick taken by Jamie McCombe. 71:43 Substitution Aaron Cresswell is brought on as a substitute for Lateef Elford-Alliyu. 68:59 Unfair challenge on Ian Goodison by Jordan Rhodes results in a free kick. Gunnar Nielsen takes the direct free kick. 68:26 Antony Kay fouled by Enoch Showunmi, the ref awards a free kick. Free kick taken by Alex Smithies. 67:44 Effort from outside the penalty area by Lateef Elford-Alliyu goes wide left of the target. 67:26 Lucas Akins crosses the ball, clearance made by Lee Peltier. 66:13 Alan Lee provided the assist for the goal. 66:13 GOAL - Jordan Rhodes:Tranmere 0 - 2 Huddersfield Jordan Rhodes finds the net with a goal from deep inside the penalty box low into the middle of the goal. Tranmere 0-2 Huddersfield. 65:11 Free kick awarded for a foul by Jamie McCombe on Enoch Showunmi. Ash Taylor restarts play with the free kick. Lateef Elford-Alliyu delivers the ball, Antony Kay manages to make a clearance. 64:55 The ball is crossed by Anthony Pilkington, Ian Goodison makes a clearance. 63:32 Shot by Jordan Rhodes. Save made by Gunnar Nielsen. 62:33 Joey Gudjonsson delivers the ball, clearance made by Scott Wootton. 62:13 Scott Arfield takes a shot. Save by Gunnar Nielsen. 61:45 The ball is crossed by Scott Arfield. The ball is swung over by Liam Ridehalgh. 60:29 The ball is crossed by Scott Wootton, clearance by Jamie McCombe. 60:04 Foul by Jordan Rhodes on Ian Goodison, free kick awarded. Direct free kick taken by Gunnar Nielsen. 59:41 Jordan Rhodes is caught offside. Gunnar Nielsen takes the indirect free kick. 58:40 The ball is sent over by Scott Arfield. 58:15 Lee Peltier delivers the ball, clearance made by Jermaine Grandison. 56:47 Jordan Rhodes is caught offside. Gunnar Nielsen takes the free kick. 56:30 Placed penalty taken by Lateef Elford-Alliyu saved by Alex Smithies. Tranmere 0-1 Huddersfield. 55:18 A cross is delivered by Dale Jennings, Liam Ridehalgh makes a clearance. Liam Ridehalgh concedes a Penalty for a foul on Scott Wootton. 55:18 Booking Booking for Lee Peltier. 52:54 Zoumana Bakayogo produces a left-footed shot from the edge of the area and misses to the left of the target. 51:57 Centre by Liam Ridehalgh, clearance by Jermaine Grandison. 51:18 Anthony Pilkington has an effort at goal from 20 yards. Jermaine Grandison gets a block in. Inswinging corner taken right-footed by Anthony Pilkington from the left by-line, save made by Gunnar Nielsen. 50:07 Alan Lee concedes a free kick for a foul on Jermaine Grandison. Gunnar Nielsen restarts play with the free kick. 49:33 A cross is delivered by Dale Jennings. 48:06 Jamie McCombe produces a cross, Gunnar Nielsen fouled by Alan Lee, the ref awards a free kick. Gunnar Nielsen takes the direct free kick. 46:34 Unfair challenge on Lucas Akins by Alan Lee results in a free kick. Free kick crossed right-footed by John Welsh from right channel, clearance by Antony Kay. 46:34 Booking Alan Lee receives a yellow card. 45:00+1:51 Lee Peltier gives away a free kick for an unfair challenge on Dale Jennings. Gunnar Nielsen restarts play with the free kick. 45:00+0:51 A cross is delivered by John Welsh, save by Alex Smithies. 45:00+0:03 The referee blows for offside against Gary Roberts. Gunnar Nielsen restarts play with the free kick. 43:49 Inswinging corner taken from the right by-line by Gary Roberts, clearance by Scott Wootton. 42:18 Alan Lee is penalised for a handball. John Welsh delivers the ball from the free kick right-footed from left wing, clearance by Gary Roberts. 41:24 Alan Lee has a headed effort at goal from just inside the area that misses to the right of the goal. 40:58 Free kick awarded for a foul by Ash Taylor on Lee Peltier. Jamie McCombe takes the direct free kick. 39:38 Effort from 35 yards by Ash Taylor went wide right of the goal. 38:53 A cross is delivered by Liam Ridehalgh, clearance by Ian Goodison. 38:14 The ball is swung over by Anthony Pilkington, clearance made by Ian Goodison. 35:32 Lucas Akins has an effort at goal from outside the penalty box which goes wide left of the goal. 34:31 Effort on goal by Jordan Rhodes from outside the penalty box goes harmlessly over the bar. 34:06 The ball is crossed by Joey Gudjonsson, save made by Gunnar Nielsen. 32:32 The ball is swung over by Lee Peltier, save made by Gunnar Nielsen. 29:26 Alan Lee produces a right-footed shot from outside the penalty box and misses right. 27:31 Alan Lee gives away a free kick for an unfair challenge on Jermaine Grandison. Ian Goodison takes the direct free kick. 25:57 Lee Peltier concedes a free kick for a foul on Dale Jennings. Free kick crossed by John Welsh, clearance by Jamie McCombe. 25:45 The ball is sent over by Dale Jennings, Jamie McCombe makes a clearance. 23:53 Scott Wootton delivers the ball, Headed effort from inside the box by Lucas Akins misses to the right of the target. Correction - 21:54 Foul by Jermaine Grandison on Jordan Rhodes, free kick awarded. Direct free kick taken by Liam Ridehalgh. Correction - 21:54 Booking Jermaine Grandison is given a yellow card. 21:54 Foul by Jermaine Grandison on Jordan Rhodes, free kick awarded. Free kick taken by Liam Ridehalgh. 21:54 Booking Liam Ridehalgh goes into the book for unsporting behaviour. 20:40 Unfair challenge on Ian Goodison by Alan Lee results in a free kick. Gunnar Nielsen restarts play with the free kick. 20:05 Unfair challenge on Jamie McCombe by Lucas Akins results in a free kick. Alex Smithies takes the free kick. 18:46 John Welsh sends in a cross, Alex Smithies makes a comfortable save. 17:16 Assist on the goal came from Alan Lee. 17:16 GOAL - Jordan Rhodes:Tranmere 0 - 1 Huddersfield Jordan Rhodes finds the back of the net with a goal from outside the area low into the middle of the goal. 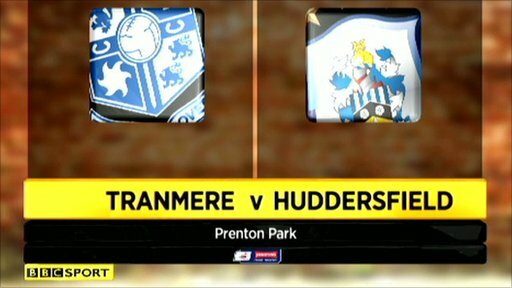 Tranmere 0-1 Huddersfield. 15:10 Free kick awarded for a foul by Ian Goodison on Anthony Pilkington. The free kick is delivered right-footed by Lee Peltier from right wing, Enoch Showunmi makes a clearance. 12:55 Enoch Showunmi challenges Jamie McCombe unfairly and gives away a free kick. Free kick taken by Alex Smithies. 11:08 Joey Gudjonsson sends in a cross, clearance made by Ian Goodison. 9:21 Alan Lee gives away a free kick for an unfair challenge on Ian Goodison. Gunnar Nielsen takes the free kick. 8:04 Enoch Showunmi fouled by Joey Gudjonsson, the ref awards a free kick. Free kick taken by Gunnar Nielsen. 7:55 Anthony Pilkington crosses the ball, Enoch Showunmi manages to make a clearance. 7:00 The ball is swung over by Anthony Pilkington, Alan Lee takes a shot. Save made by Gunnar Nielsen. 3:57 Joey Gudjonsson has an effort at goal from outside the box which goes wide left of the target. 2:14 Pass corner from right by-line taken by John Welsh to short, clearance by Gary Roberts.